We understand that it’s not easy to drop off your baby for the first time and head off to work. We are extremely lucky to have Cindy Goodman, who not only assisted in the design of the Infant Center in 2007, but has been the Lead Teacher ever since; she has loved and cared for over 100 babies! Our loving teachers take great care of your baby but they are also there for you as a parent. We believe that raising a child is a joint partnership, and communication between teacher and parent is key. Our Infant Center’s curriculum meets the PA learning standards, and is an environment where a baby can grow. This cozy classroom is just the right spot for new walkers who are ready to explore their world. Toddlers are gaining independence and developing rapidly. Our preschool early education program provides a balance between nurturing these little ones and encouraging exploration of the world around them. Being a toddler is a very busy time and this class definitely meets the challenge. Our developmentally-appropriate toddler curriculum focuses on social and emotional skills, language, and cognitive, physical, and creative development. Our teachers help children to learn about themselves, relate to others, and explore and learn about their world. Jewish values and holidays are interspersed throughout our curriculum through song, play, stories, music and fun. Two years olds have now found their voice and love to take charge. Our teachers encourage children at their own pace to become self aware, develop self confidence, express thoughts and ideas and to explore. We enable your child to learn through a variety of materials according to individual needs and abilities. Our curriculum is designed to keep a busy two-year-old stimulated and learning in an environment that is hands-on, experiential and of course fun! Jewish values and holidays are interspersed throughout our curriculum through song, play, stories, music and fun. 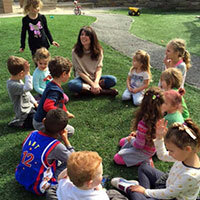 As three year olds become more self-reliant and independent our teachers plan lessons that foster academic, social-emotional, physical and spiritual development through experiential, interactive and fun learning experiences. The PA Standards incorporate language arts, mathematics, science/social studies, art, music and physical activity. 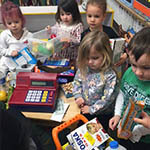 We recognize that it is important for children to learn on an individualized basis and at his/her level, but also how to work together in a group. We believe in developing core values such as kindness, respect, self-confidence and responsibility. Jewish values and holidays are interspersed throughout our curriculum through song, play, stories, music and fun. We know how important this year is for our Pre-K students. It is our job to prepare children to enter Kindergarten. Students have the opportunity to learn through centers such as music, art, library, science, math, dramatic play, writing, reading and music. This time provides opportunities to balance both shared and independent learning; teamwork and independence go hand and hand. Our curriculum is based on the PA Learning Standards. Our activities and programs are hands-on, age appropriate and experiential. We consider the “whole” child and the variety of interests and learning styles of each child. We review and assess your child throughout the year and communicate this important information to you. We are joint partners in your child’s growth and learning. Jewish values and holidays are interspersed throughout our curriculum. 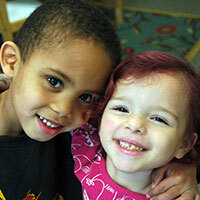 It is also our goal for children to develop life skills, social skills, and friendships. Lesson plans are posted in the classroom so you are aware of “what”, “why” and “how” we are teaching. We are a Keystone Stars 3 school which means we participate in the PA State initiative of the Office of Child Development and Early Learning (OCDEL) to improve, support, and recognize the continuous quality improvement efforts of early learning programs in Pennsylvania. Our Center is licensed by the Department of Human Services.